Williams always knew where the chicken with the golden eggs came from..Pastor. For half of 2012 races Senna had to give up his seat to Bottas on Friday practice. I imagine that is where the drivers set the car for Saturday qualifying. Pastor seems an aggressive driver, but teams are also interested in the Constructor Championship and Pastor need to stop acting like a rabbit and pace himself. Explosions of speed will not get him to the end. In fairness to Senna, he had to brake early because his tyres were finished. That also explains the weaving, because IIRC it was hardly dramatic. it was Schumacher's fault end of story hence his grid penalty and senna didn't weave in and out he made his defensive move Schumacher misjudged the brake zone because he didn't take into acct senna had older tyres, Schumacher was immense in his day but these mistakes began to creep into his driving. Happened with vergne in Singapore too, i don't say this because i blindly say senna is at fault for nothing for instance in Valencia he failed to check his mirrors and got clipped by KK. All drivers make mistakes Maldonado and grosjesn just made more high profile mistakes more often than most. Missing a lot of Friday sessions in order to give Bottas a chance definitely had an effect on Senna (and the advantage for Williams is fairly clear to see). And who knows, maybe Williams’ dependency on Venezuelan money resulted in subtle little differences in treatment. Performance in F1 is largely dependent on morale, but morale is largely dependent on performance. Get a bad start to a season, and you might stay in a rut for months. It’s a tough sport. Senna didn't really have it easy, but really he could consider himself fortunate to have gotten himself a competitive drive at all. If the Heidfeld/Renault experiment hadn't failed, Senna more than likely wouldn't have gotten a look in. He showed some potential, at races such as Spa and Monza in 2011, then in Malaysia, China and Hungary in 2012. Ultimately, this probably caused a lot of frustration for Williams - When he was good, he was very good and when he was bad, he was very bad. And unfortunately he was bad more often than good. The politics thing is so difficult - It undoubtedly exists, and we don't get to see it. However, as has been said, it's such an obvious excuse for so many drivers who don't succeed in F1, that we can't tell who is honest and who is bitter. I see his point, as he was definitely compromised compared to some other young drivers given he started in an absolutely dreadful car, then restarted mid-season and ended up getting limited testing time in his only full competitive year. Ultimately though, I'd have to say that unless Maldonado is some sort of Senna-esque speed demon, being (on average) half a second slower than your team-mate isn't good enough to make the grade in F1. Nonsense, Vettel had 1/2 a season in F1 in a backmarker and it was sufficient to get McLaren interested. Hamilton had *no* season in F1 when he was brought in. Senna drove sufficient time in a sufficient car to show his capability. It is true that he might be better down the line - but you have to take the team into account. Who can afford to apprentice Senna? Koba? Kova? Algur? Showing promise of a possible bright future is not good enough. You have to have a lot of money to go with that and be willing to pay for a drive at the back of the grid. Otherwise, be prepared to wow the teams in a very short period of time and quite possibly in unfavorable circumstances. True, true...this is why I said he should have taken a race drive, even for 1 year, if that was a real opportunity and not only twisted words, and give it his best shot. Say's a lot about the man that he was having a miserable time but still came across as happier and more thoughtful than most of the grid. Like his Uncle, he knows that there are millions worse off than him. It shows a lot of character and self respect that he didn't whinge and complain like so many others do. It seems that humbleness is a family trait. It's pretty damn remarkable that he ever made F1 at all given his career's hiatus. FWIW he was often stronger than his team mate during races in 2012. Sad to see him go from F1 but if he finds that enjoyment being a racing driver again then it will be for the best. The most popular theory is that was Schumi brain fade in Spain...not dissimilar to Singapore except in daylight hours. Bruno also got handed one of the harshest penalties in recent memory in Valencia IMO. Wel, I think we can conclude Senna had a hard time in F1, yes, partly because he struggled to keep up with the pace (caused by numerous reasons all well spoken about), and partly because his own growth was blocked by background games we won't ever fully understand because we don't see them. Imagine you going to your work everyday, not feeling happy with it, and not feeling you are being presented a good and supported situation where you can develop yourself and show what you are capable of. I would resign too and go somewhere else. You have people who can live with that kind of situation, but if I see how nice and humble he is, and knowing how badly Ayrton could cope with all kinds of political games, I can imagine the atmosphere he was in didn't suit him at all. Maybe he's a bit too nice. And don't forget, Bruno made clear he would like to come back to F1 of all is well. But the main thing is he must enjoy what he is doing. Posters' assessments of Bruno give an accurate picture. The Friday testing time 'taken away'and his late start in F1 must be the decisive factors in his career. He really raced consistently and well in 2012 and brought home the points. Seemed to be a very nice, sincere person. But he was never going to get anywhere near his uncles in the bottom 3 teams which was probably his only options for 2013. That won't bring joy to anyone. Not when you had a relatively successfully 2012 season in the points and some money to back it up. Last edited by Seanie on Fri Feb 08, 2013 10:51 am, edited 1 time in total. i think with Williams it was part money part wanting to busy whatever demons he had from 1994, it must have played on the mind of every designer and exec at williams its traumatic enough when anyone dies before their time but the highest name in the sport at that time. Maybe getting senna through a full season is a bit of closure. I always thought he was a decent guy, and for me SPA qualifying with Lotus showed what he was made of. i really don't doubt he had the race pace and maybe even quali pace as in Williams he was not given the same treatment as Pastor. He just suffered from not having sponsorship as strong as Pastor, that is all. and if you look back he didn't really get a decent run in F1 starting in a very slow team, then being a reserve and racing only half a season then getting a decent seat but losing a day running. now look at those handicaps and the fact the he more often than not scored points and you have to respect that, he is no Karthikeyan. If Williams weren't cash-strapped, Bruno probably wouldn't have even had the seat. He was more consistent than Maldonado but clearly has nowhere near the potential, that is the key factor I think. Maldonado put the car in places where Senna never has or ever will look capable of. Bottas has looked good up til this point and I do think its a stronger line up for Williams this year, although some disagree reading back over this thread. Good that he has found another series to race in because he is a very capable driver, just not good enough for the front end of F1. Its good to see he isnt satisfied just trundling around at the back of the grid purely to stay in F1. Asked why he didn't go to the complete left of Senna, Schumi said he would have done but he was already arriving in the braking zone, which was also a downhill braking zone, and he couldn't slow down sufficiently and steer left at he same time. His complaint was that Senna dummied right, then moved back left as he braked. I think the penalty was harsh as I don't really see how Michael could avoid it. The Singapore incident was just Michael losing it under braking on cold brakes, unfortunately there were cars ahead of him because it was just after a safety car. That was a rookie mistake and it was his fault. So not really comparable. I don't really see why grid penalties are necessary for any whatsoever of these sort of incidents, being out of the race is punishment enough so why punish someone twice for the same crime. It doesn't make any sense. I'm not really a fan of grid penalties in general tbh, they spoiled the 2005 season. I remember Senna getting a penalty in Valencia and yeah it was very harsh. Although I don't know why he was changing lines so unnecessarily while on worn tyres with faster cars behind him. There is a lot of GP2 in his racing, a bit like Grosjean, Perez, Hulkenberg et al, more seasons in F1 might have changed that (Maldonado meanwhile is on a different planet). By GP2, I mean drivers like Schumacher or Raikkonen, every move they make on the track has a reason to it, a thought behind it, and otherwise they hold their line, but the GP2 guys tend to make moves just because they can, or for no apparent reason, as if they are looking for some clever move that isn't actually there. It all looks slightly frantic. I think it's going to be like this for a while in the F1 midfield, because of the pay-driver-revolving-door, and a corresponding lack of driver experience like Barrichello, De La Rosa, Heidfeld, in the F1 midfield. However, Christian Klien was in fact exactly half a second quicker than Brazilian rookie Senna, cutting the deficit to F1's other new teams to just five tenths. sennas move had purpose he had just lost his place to KR and was moving into his slipstream to try and keep up with him remember there were 5-6 drivers all within a second or two KK made what can only be described as an opportunist move,but senna was still at fault he should have double checked knowing there were so many drivers around, having said that i thought the actual penalty was harsh, as for Schumacher in Barcelona he could have avoided it because many other drivers have managed similar incidents without ramming the driver ahead. Infact many journalists and people around the paddock say that that incident alone has extremely lowered their opinions of him and tarnished his comeback even more than not reaching the heights he did because he blamed senna and wouldn't except he had messed up, it wasn't even the fact that he held senna responsible but that he was so public about it. I think it's harsh to blame Senna completely in the incident, however, what bothered me most was that Senna's tyres were going, and he had nothing to gain from battling it out with the much faster cars. If memory serves me well, Schumacher, Rosberg and co were well ahead of Senna, and that wasn't his battle to fight, holding up Schumacher would've gained him nothing. And in the end both had their races ruined. Again, don't get me wrong, I'm not trying to say Schumacher was blameless, but neither was Senna, in my opinion. By happy he means slow. To be fair, Klien was indeed half a second faster during their first race together, but a lot of people seem to forget that after that (Abu Dhabi and Brazil), Senna matched Klien, and at Brazil even outperformed him by half a second. Klien had experience and Senna caught up. 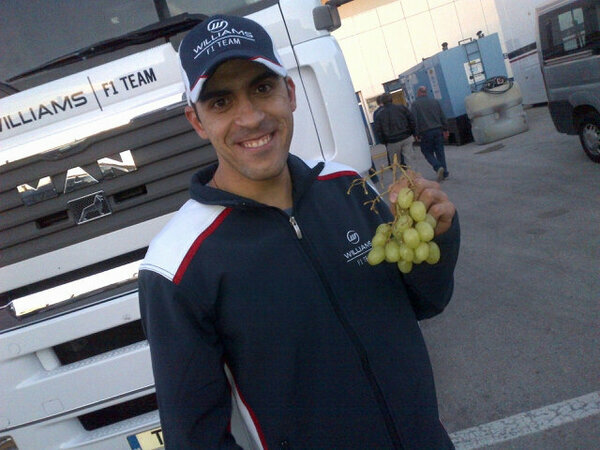 Hey Bruno, you left some of your soup grapes behind in the Williams motorhome. We need more people with the good attitude of Bruno Senna in F1. He will be missed. Being out qualified 2/3 times by a driver just stepping into the car you have been driving all season is not impressive. Does not help that Klien had not raced for 4 years and hardly set the world alight back then. Exactly stay in and beat your teammate to try and further your career, but then again who has he ever beaten? I really did not understand why people was all over Bruno. He's a great guy and we can all see that, but being nice does not necessarily means success. He was very consistent, but who knows what his future holds. It is a bit unfair how he was denied P1 to practice, but from then on Bruno knew he was a stop gap to Bottas. He was not going to stay at Williams for another season and if he was offered another seat, I wonder why he did not take it? I understand this though to be successful in what we do for a living, we have to love/enjoy it. If, Bruno did not enjoy then I understand it. I wish him luck, but I'm not going to miss him. I will keep tabs on him in WEC. He got more chances than he deserved. Mainly due to money and name. The drivers which started with him were not so lucky. He got 3 years when driver who was outperforming him at HRT did not get even a full year. I said it before and I will say it again, he didnt achieve or do anything in 3 years so that he will deserve a seat over anyone who is on the grid today. There are better drivers sitting out, he is nothing special. He is not bad, but I never saw that spark in top drivers. Many journalists and people around the paddock are waiting for Michael Schumacher to make a mistake and jump on it, so of course they would say that. You will never ever see Michael Schumacher changing lines and braking early, because it is dangerous. It was just pointless weaving, the kind that sooner or later is going to result in a very nasty accident. And Bruno Senna was nothing but a distinctly average F1 driver who blew his chance to shine in a race winning car last season. Being nice means nothing in sport.